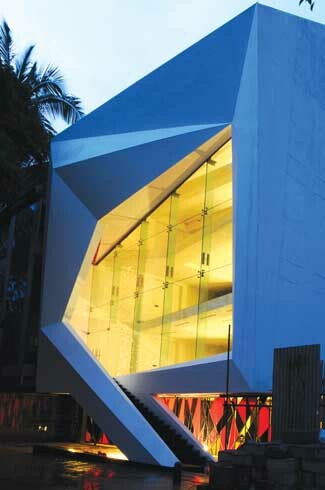 The Bengaluru-based practice, Cadence Architects is a master of eye-catching facades. The team at Cadence Architects loves setting up a display of mighty geometric concrete slabs and arrow-heads whooshing about in a building. There is always a slight element of drama in their facades, which forms an eccentric complement to the stability of the oft-used glass. This leitmotif has also yielded Cadence a long list of awards and popular mentions, and built them an ambitious portfolio of work. 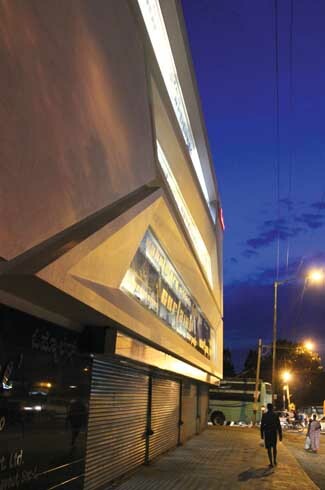 Cadence was envisioned and realised in Bengaluru in 2005 by architecturally kindred souls Narendra Pirgal, Vikram Rajashekar, and Smaran Mallesh. The Candence style is clean cut, with great sweeps of space in the interiors and a predilection towards making good first impressions through extraordinary facades. The firm experiments well with forms and scales of projects – villas, schools, retail structures, and housing – but do expect reinforced cement concrete, concrete block work, and Ferro-cement to crop up often in project descriptions. Admittedly, the site of Aikya in Bengaluru was small, but the commitment to building a “visual experience” becomes more fun when presented with a challenge. Situated in the tony Jayanagar area of Bengaluru didn’t make it any easier, faced with stiff competition as it was in the looks category. Though the commercial complex demanded a de rigueur glass façade, the Cadence team did not give up on its artistic leanings. It built the glass core for sure, but enveloped it in a dramatic, geometry-defying encasing. 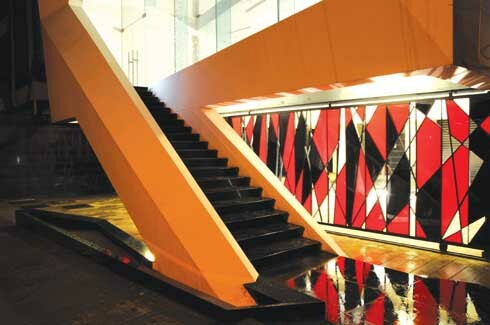 A staircase in all Ferro-concrete glory stands like a drawbridge to the building, with a slick red and black montage as its backdrop. Reinforced cement concrete, and concrete block work define the rest of the structure three floors of shops, and a penthouse above them. The key to this project’s success is that it set out to realise a visually stimulating project, and it did so with easy-looking panache. Commercial complexes are often weighed down by their utilitarian needs, and style is often the victim in the scheme. But working with the core needs of the commercial establishments – making sure they have a good viewing gallery, uncluttered parking, etc. – and combining them with a brand recall worthy façade is achievement indeed. Any project coming up in the midst of a natural setting faces a clash between wanting to stand out, and not wanting to disrupt the inherent character of its surroundings. Splice is another commercial complex to be squeezed into a small site. But also, as Cadence discovered, another chance to turn the typically staid shop front tradition on its head. At the fulcrum of Cadence’s rebellion of form are concrete rhombuses and quadrilaterals, lounging like leisurely tourists on the broad façade. Peeping through from between are the glass walls of the shops, not too exposed, but offering enough hints to raise curiosity. The team wanted to “alter the horizontal reading of the elevation”, so ceilings, shelves and desks seem to break dance throughout the complex, possibly making the consumers wonder if something just moved positions right in front of their eyes. This kind of deliberate befuddlement is a brilliant strategy by Cadence, as it makes the retail experience more dynamic. 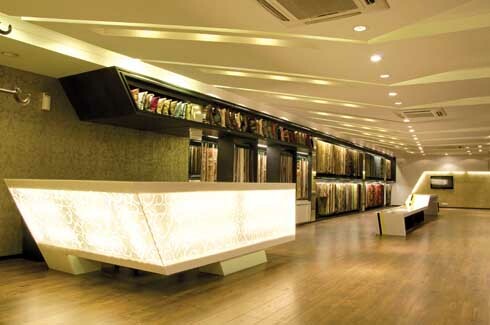 Today’s consumers are well aware of the effects of lighting, texture and colours of a shop’s interiors in shaping their shopping moods. Inside Splice, they are sure to appreciate the smartness with which this end is achieved. 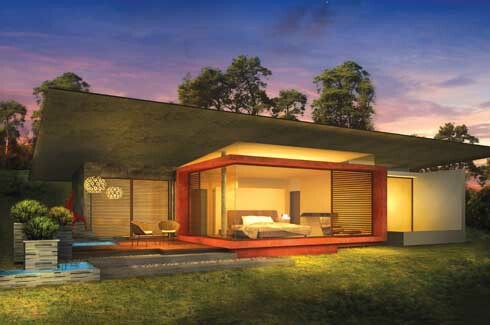 Java Rain resort faced a similar conundrum while being imagined at the foothills of the mighty Mullayanagiri hills, with a valley and the Chikmagalur town standing as scenic brethren. To achieve the balance, Cadence played the rustic-yet-contemporary card, bringing in locally sourced materials to stay true to the tone of the place. The sharp-cut elevation and contours of the buildings are softened by wood inlays, and pebble-and-shrub walls. The roofs are mostly flat and mighty here, stretching out and enhancing their dramatic backdrop. 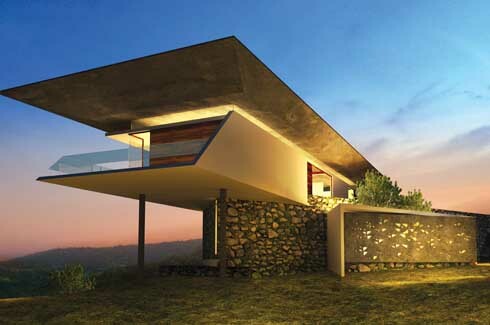 Java Rain will feature 10 villas, a restaurant, and a spa. But the cynosure will be the Tree House café. Fashioned like a stacked up tower of concrete chunks, it looks infallible and vulnerable at the same time. There will be a fountain structure here; a lake for viewing; and on all floors the feeling will be of open communion with nature. Coffee would taste more stimulating at this elevation.